With a 3-in-1 mowing system, the Toro Recycler 22 in. 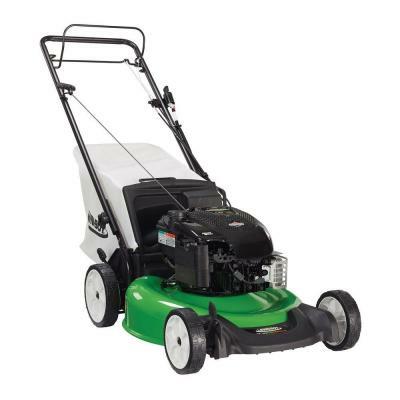 6.75 Gross Torque OHV gas variable speed, high-wheel mower offers bagging, mulching and side discharge capabilities for flexible performance in all mowing conditions. The 11 in. (28 cm) rear high wheels and variable speed front wheel self propel drive system will help you tackle uneven terrain with ease. The Recycler's 149 cc Overhead Valve engine provides great power. Backed by Toro's 3-Year Guaranteed-to-Start promise and 2-Year Full warranty. Lightweight and comfortable, this gas blower provides exceptional performance with a low-noise level. The 25.4 cc professional grade engine produces 375 CFM and 158 MPH at the nozzle at only 64 dB(A).The product comes with a 5 year consumer 2 year professional warranty. ​Ariens Compact Two-Stage gas snow thrower with a powerful 208cc engine and 24 in. clearing path. Great features like electric start, self propelled drive, in-dash headlight and remote chute control with up to 40 ft. throwing distance. Cast iron gear case with a 5-year warranty, and a 3-year warranty on the machine. The PAS-225VP features a 21.2 cc professional-grade, 2-stroke engine and two attachments. The split boom design allows interchangeability with ECHO's Pro Attachment Series and accommodates up to 12 attachments. The i-30 starting system reduces starting effort by 30%.